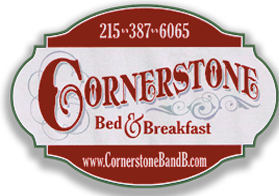 The Cornerstone Bed & Breakfasts in Philadelphia is truely a Victorian Gem. Located just blocks from Drexel University and the University of Pennsylvania, our beautiful B&B is a quiet retreat set among a towering tree lined street in University City. Built in 1865 as a private residence before being converted to a bed and breakfast, we have retained much of the buildings original appearance while modernizing our rooms and suites to meet our guest’s contemporary needs. Our home’s elegant carpentry, original hardwood flooring, and ornate stained glass windows will transport you back to a simpler time, yet we are conveniently located near a thriving downtown, the Philadelphia Museum of Art, the Barnes Foundation, the Philadelphia Zoo, and 30th Street Station.